Read a sample of Starlite Lanes in the seat of its award here! Readers who love male-oriented adventures. …and some are less likely than others to do so. But when a county team from Utah discovers a strangely heavy bowling ball that doesn’t belong up their alley, it sends them afoul of the Mafia, federal agents and a renegade Cuban terrorist. This leaves them little choice but to uncover the mystery of the ball, discovering the heroes that they always knew they weren’t. In and out of the Starlite Lanes Bowling Emporium, the Pin Punishers bowl for their freedom, their lives, and they bowl to protect democracy. Beer and buffets fuel the path to counter-terrorism. – Gil Chetney: injured ex-professional bowler and patriotic fireworks enthusiast. Chapter 3: Equality Winner of an Honorable Mention in theTextnovel prize, and a final reading in the Serena McDonald Kennedy award . Disgusted with talks of reconciliation between Cuba and the USA, a celebrated revolutionary General defies the new Cuban President to bring a mysterious weapon onto American soil. In order to avoid detection while traveling, the General orders the device to be encased in a substance dense and thick enough to thwart X-Rays. His perfect choice: a modified bowling ball. Enter The Pin Punishers, an affronting but innocent bowling team who take part in a county league from Provo, Utah. Along with night manager of the Starlite Lanes Bowling Emporium, Paul Petraluk (known to them as “Puck”), The Pin Punishers are destined to have their lives intertwined with the enigmatic ball. Accustomed to nothing more exciting than unpaid bills and an occasional lunch at the Cram-a-rama Buffet, the protagonists quickly find themselves pursued by all sides of law and global conflict. The fight for their own freedom expands into a fight for the freedom of the western world, as Puck narrates the story of the team’s efforts to determine the reasons they must keep the ball out of dangerous hands: hands that include the General’s, the mafia’s, and a pair of hard-luck Homeland Security agents. 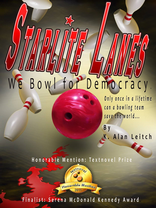 Part of The Provo Trilogy, Starlite Lanes reconnects with a definition of ‘Democracy’ that the free world is in danger of forgetting. It empowers the Americans best suited to love their country and restore its noble ideals; her blue-collar bumblers.